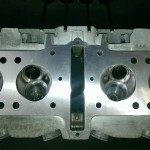 As part of an upgrade for racing or high performance engine, it may be desirable to increase the size of the valves in the cylinder head for improved gas flow. Oversize valves are available from a wide range of manufacturers but will need specialist machining work carried out on the cylinder head to make them fit correctly. H T Howard have the knowledge, expertise and machinery required to convert your motorcycle cylinder head to accommodate new, oversize valves. All machining work is carried out using our Serdi 100 machining centre and all valve seats will be recut with a minimum of three angles (frequently as many as five are used) to blend with the combustion chamber and port throat shapes. 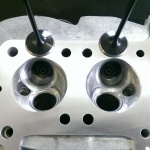 Special attention is paid to the depth of the valves in the combustion chamber in order that correct valve spring tension and valve clearances are achieved. 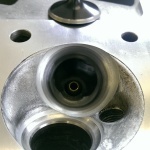 Generally, moderate increases in valve diameter are achievable utilising the existing valve seat inserts but for more extreme conversions it may also be necessary to fit larger valve seat inserts.